One not need a JD from Harvard, or any legal degree at all, to recognize that Blackmail and Extortion, fundamentally the same thing, are crimes. Codified in the New York State Penal Law under Article 155, Extortion is a form or means by which a person commits Grand Larceny, a felony. By default, no matter the property type or amount secured by Blackmail in New York, Penal Law 155.30(6) makes any extorter or blackmailer guilty of a class “E” felony upon conviction. If the value of the property secured by the blackmailer is north of $3,000, $50,000 or $1 million, so is the extorter’s exposure to significant lengths of incarceration on greater felonies. Moreover, if violence is part of the extorter’s conduct, the offense level can also be increased. Sometimes the crime of Extortion is easy to identify, investigate and prosecute. Other times the target is either hard to identify, find or legally pursue within the bounds of the law. Whether you, as a victim, go to Federal, New York State or local law enforcement, or you retain an Extortion lawyer to fend off a wrongdoer so he or she ceases and desists, is your decision. However, the question addressed in this blog entry is potentially a complicated one on its face, but one easily addressed by the law. 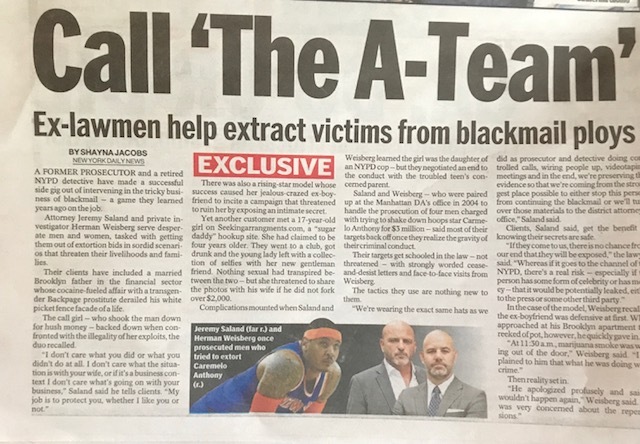 If you reside in New York, but your blackmailer lives out of state, can her or she still be prosecuted by a District Attorney or can your New York Extortion attorney still attempt to stop your victimizer with a cease and desist letter or other legal means? Am I the victim of Extortion? Am I being Blackmailed? How are these crimes different than Coercion? I know someone is preying on me and making demands, but what, if any, crime has this person committed? To answer these questions lets examine the following scenarios. I’m being threatened over some pictures my ex got a hold of. If I don’t pay him he will send them to my employer, landlord and friends on Instagram. I’m being threatened over a compromising video my ex secured without my permission, but instead of wanting money she says that if I don’t tell my family that I’ve done something wrong or admit to my boss I’ve used drugs, she will share it with these same people. While the above hypotheticals may seem very similar, very similar and the same are quite different. In the eyes of the New York Penal Law, criminal defense lawyers, prosecutors and judges, the above two scenarios are the foundation of two distinct and separate crimes – Grand Larceny Extortion (Blackmail) and Coercion respectively. Many people believe that if you need a top criminal defense attorney, or any for that matter, you are clearly guilty of something. Whether that belief is misguided is fairly irrelevant, of course, until it is you who needs a criminal defense lawyer. That said, there are very few things in life as debilitating and emotionally destructive as being accused of a crime you did not commit. Maybe you did something morally wrong or maybe you did nothing improper at all, but law enforcement, such as the NYPD and the District Attorney, or a complainant incorrectly interpreted your acts or intent. Yes, where there is smoke there is often fire, but life teaches us that this is by no means a given truth. You, the accused, have rights and the prosecution must prove their case beyond a reasonable doubt. Their failure or inability to do so means your case should be dismissed. For a recent Crotty Saland PC client employed in the banking and financial sector, a dismissal of all charges, including felony Third Degree Grand Larceny, is just how the criminal case ended not merely because our client was innocent, but due to advocacy of those same criminal defense attorneys many of us believe only represent the guilty. At first she demands a few hundred or even a couple of thousands of dollars. Maybe he tells you he just needs some money because of an emergency, but you know what’s coming. You’re not naive. You can see the writing on the wall. Blackmail. Extortion. Coercion. Harassment. You say to yourself, “I am being blackmailed. I am being extorted. Do I hire an attorney to get my blackmailer to stop? Is there any alternative to stop an extorter other than the police? How do I best keep all of this a secret and not expose my affair, drug use, business fraud or other wrongdoing whether it is my victimizer is telling the truth or concocting a completely bogus story?” While each situation demands a different analysis as to the pros and cons of protecting yourself through the assistance of law enforcement or an attorney and private investigator, the moment you have handed over even one dollar to your blackmailer, he or she has committed the felony of Grand Larceny Extortion. That crime, Fourth Degree Grand Larceny, New York Penal Law 155.30(6), is a class “E” felony with a potential sentence of up to four years in prison. If your extorter threatens violence and some physical injury or to damage your property, the offense jumps to a class “C” felony of Second Degree Grand Larceny, New York Penal Law 155.40(2). Again, irrespective of the amount actually secured from you or the nature of the property, this offense is punishable by as much as fifteen years in prison. As important as it is to know the consequences of your victimizer’s actions, it does not answer the question as to what you should do. Do nothing and hope that it will stop? File a complaint with the police? Hire an attorney to stop your extorter in his or her tracks? While the first of these options is not much of an option at all, the New York Daily News’ story on Crotty Saland’s PC’s “Busting Blackmailers” puts one option front and center. Any attorney who claims that white collar crimes are not as serious as those involving violence is a lawyer who likely has neither the knowledge nor experience how thefts, larcenies, frauds and other schemes are investigated and prosecuted in New York City or elsewhere in the Hudson Valley. While a theft crime for Embezzlement, Extortion, or another related offense may not require mandatory prison and incarceration upon conviction in most circumstances for first time offenders, the practical reality is that a sentence “upstate” is far from atypical. Even those who don’t face a sentence of this magnitude recognize that a felony conviction will forever tarnish their name, follow them throughout their lives and careers, and end never be expunged. Want to work in the financial sector, public sector, as a teacher, lawyer, physician, accountant, nurse or merely have a professional career? It will be a long time before you ever, if you can, run away from a conviction. Fortunately for a recent Crotty Saland PC client charged with Second Degree Grand Larceny, New York Penal Law 155.40(1), Fourth Degree Criminal Possession of Stolen Property, New York Penal Law 165.45(1), and Fourth Degree Grand Larceny, New York Penal Law 155.30(4), an adjournment in contemplation of dismissal will remove one of the most horrific experiences of our client’s life within six months.